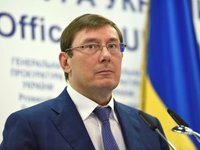 Kyiv's Solomiansky District Court has obliged the National Anti-Corruption Bureau of Ukraine (NABU) to launch a criminal investigation into a possible corruption offense by Prosecutor General Yuriy Lutsenko after it received a statement by law enforcement bodies. The ruling of Kyiv's Solomiansky District Court, which has been registered in the Unified Register of Judicial Decisions on January 10, states that the court considered a complaint about the inactivity of NABU employees who had refused to launch criminal proceedings following a statement about a possible offense by Lutsenko and his first deputy Dmyto Storozhuk. In his complaint, the complainant said that he had a meeting with the head of the SBU State Security Service of Ukraine Vasyl Hrytsak in his office and filed a statement "about a corruption offense committed by the Prosecutor General in league with his first deputy." The SBU sent this complaint to the NABU for investigation; however, the NABU, in turn, did not see any grounds for commencing the proceedings. Thus, the applicant decided that the NABU's refusal to open proceedings on the facts stated by him was unreasonable and filed a suit with the Solomiansky court. The court decided that the statement contains factual data and there are grounds for entering information into the Unified Register of Pre-Trial Investigations. "To oblige an official of the National Anti-Corruption Bureau of Ukraine ... to enter into the Unified Register of Pre-Trial Investigations ... information about a criminal offense," the investigating judge of the Solomyansky court said in his ruling. The court's ruling does not mention the name of the applicant and the kind of data that was revealed, on the basis of which the NABU has to open the proceedings and conduct an investigation. It only says a possible criminal corruption offense is involved.